With IronCAD’s Design Collaboration Suite, engineers communicate more freely. Dual ACIS and Parasolid kernels allow precise, error-free import and export of native SAT and X_T files as well as common file formats like IGES, CATIA V4, and STEP. Add the low-cost TRANS bundle and even access native formats such as CATIA V5, Pro/E (Creo), UG/NX, SolidWorks, and Inventor. Use IronCAD’s Design Collaboration Suite to facilitate an open exchange of ideas and refine projects. Share work between designers in the office or customers in the field regardless of what CAD program they use. Take advantage in both IRONCAD and INOVATE to edit almost any imported files without recreating geometry by using direct face modeling or adding new intelligent 3D parts from standard component catalogs – a perfect fit for suppliers who work around other engineer’s designs. IronCAD’s Design Collaboration Suite has the most complete set of data translators to allow both faceted and solid geometry to interchange with all leading systems. 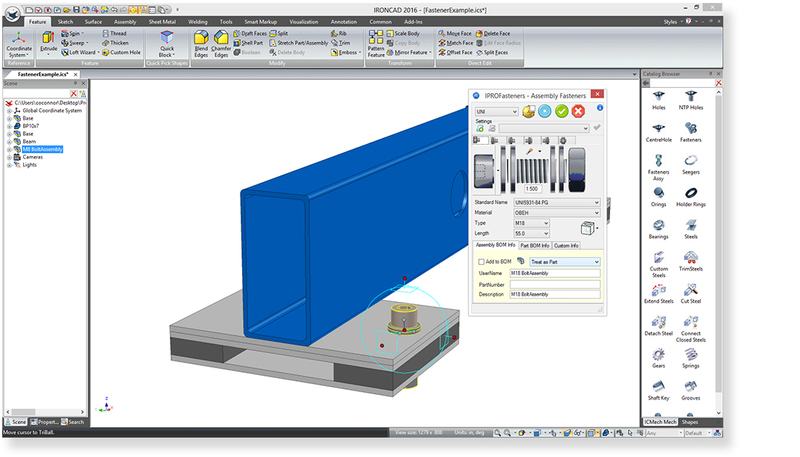 Explore additional capabilities on Imported geometry to meet design requirements. Polygonal formats can be converted to solid with planar and curved surface fitting and then modified as any other solid data on-demand. Automatic feature recognition can identify and create features on imported data. Supported feature types include blends, face-based IntelliShapes, extrude IntelliShapes with profile reconstruction and draft recognition. IRONCAD-TRANS and INOVATE-TRANS. Native CAD translator to run alongside IRONCAD or INOVATE respectively, providing read/write capability for CATIA and also read capability for Pro-E, Unigraphics, Solidworks & Inventor. This will enable users to communicate effectively at all levels. DRAFT-TRANS. Native CAD translator to run with IRONCAD DRAFT, providing read capability for CATIA, Pro-E, Unigraphics, SolidWorks & Inventor. This delivers a very powerful, yet low cost solution for 2D users wishing to collaborate with 3D data. COMPOSE-TRANS. Native CAD translator to run with IRONCAD COMPOSE, providing read capability for ACIS, PARASOLID, IGES, STEP, CATIA, Pro-E, Unigraphics, SolidWorks & Inventor. This delivers a very powerful option for users wishing to collaborate with 3D data for viewing, rendering, animation, and configuration. Note: All imported data is 3D graphical data. IronCAD Mechanical is an IRONCAD catalog that includes pre-made designs for industry-standard fasteners, bearings, O-rings, piping, and flanges, saving fabricators hours of design time. Just drag and drop these readymade designs into assemblies, where they will attach themselves to other parts thanks to IRONCAD’s built-in intelligent behavior. 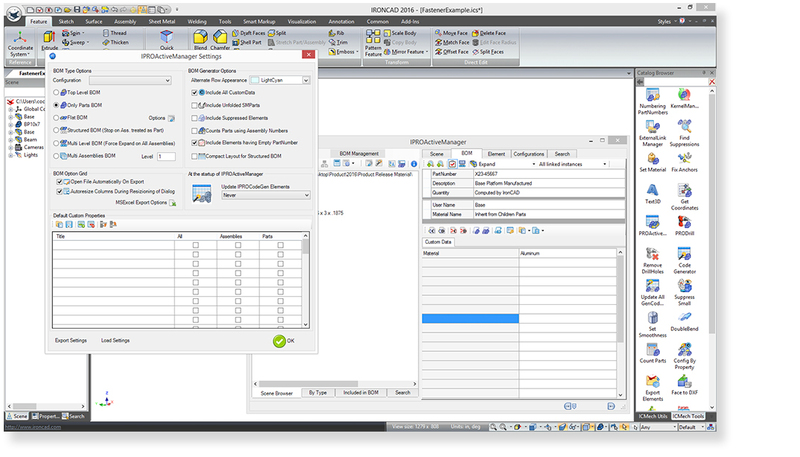 Integral to IronCAD Mechanical is PROActiveManager, a powerful, fully configurable Bill of Material (BOM) data manager that allows quick access to all BOM data in a 3D scene. PROActiveManager can configure or suppress parts and can be used to find and replace text embedded in any component in a part or assembly. 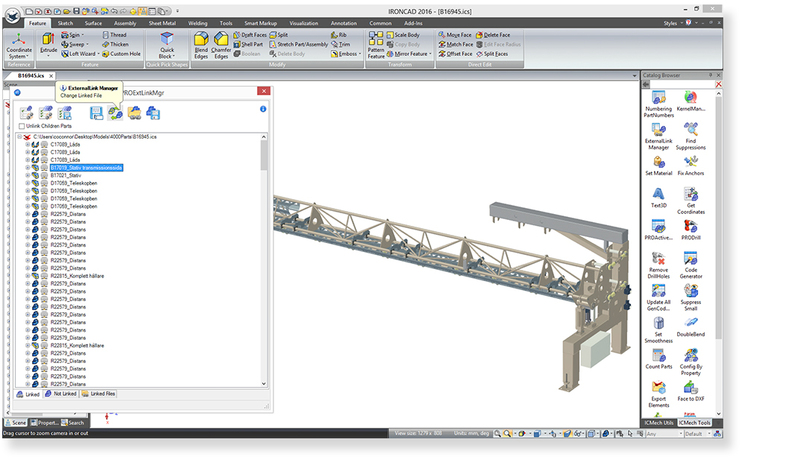 IronCAD Mechanical also comes with a number of additional time-saving features for fabricators, including a tool for creating parametric holes and recesses that can then be saved in catalogs for repeated use; shape utilities that toggle parts from solid to negative; a visual database of materials that can apply different densities to parts or assemblies; and many more. Add-on - Native CAD translator to run with IRONCAD and/or Inovate providing read capability for CATIA, Pro-E, Unigraphics, SolidWorks & Inventor. IronCAD’s new Mechanical Add-In (IronCAD Mechanical) offers intelligent tools for fabricators such as Industry Standard fasteners, steel sections, piping, flanges, bill of material generation and much more.